Santa Margherita from Giuseppe Papini’s 2017 bridal collection. Alluring and filled with unexpected touches, the 2017 Giuseppe Papini bridal collection evokes the kind of effortless beauty and head-turning elegance you would associate with contemporary fashion’s concept of sprezzatura, the art of looking put together with seeming ease. Indeed, this collection charts designer Giuseppe’s exploration of the qualities that make “Made in Italy” design — which holds excellence in technique and quality to the highest regard — so well-loved and coveted internationally. Capri, features a vintage style high-low skirt with a train. Giuseppe Papini’s 2017 bridal collection is a journey, a path, a celebration of Italian excellence. The timeless elegance and romance of these wedding dresses is illustrated by a fairy tale setting in an antique Italian villa and a magical garden. The perfect backdrop for a collection that is entirely conceived and manufactured in Italy, and a real tribute to the country where the brand lives. 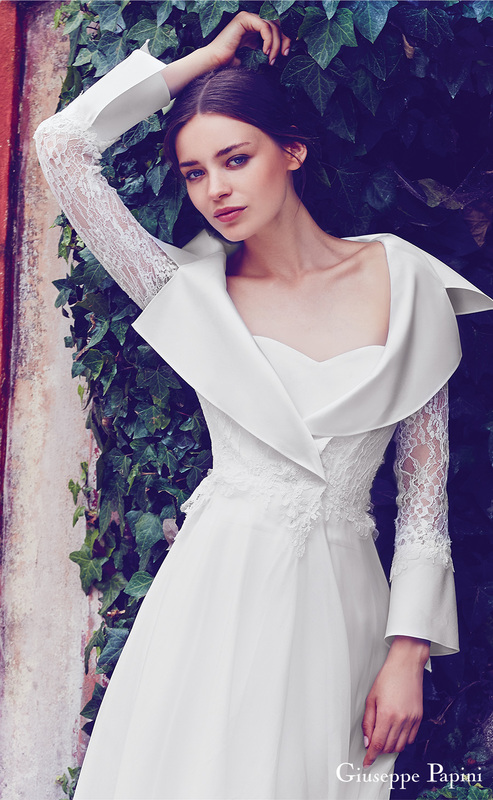 Meticulous attention to detail, the best fabrics, supreme quality and high-level sartorial techniques always characterize Giuseppe Papini’s work, one that is synonymous with craftsmanship and Made in Italy. Capri’s sleeveless V-neck bodice is decked out in beading. Named after the designer’s favorite places in Italy, Giuseppe Papini’s 2017 wedding dresses are full of inimitable charm, just like the iconic towns and cities that inspired them. The 2017 bridal offerings range from graceful strapless ball gowns (Milano, Taormina) and dreamy A-lines with over-sized bows (Rome, Venice, Porto Venere) to a distinctively modern sheath, Verona, which features a fully embellished bodice and wide sash belt. Other standouts for the contemporary bride include the wide-collared Florence, and Positano, a sleek strapless creation that’s elevated by a unique overskirt. These wedding gowns can be customized with accessories, like cover-ups and skirts, creating one of a kind looks to fulfill the dreams of the bride on the happiest day of her life. Let’s take a walk through the rest of the beauties of this collection, shall we? Amalfi features a distinctive lace design on its sheer bodice with high neckline. Striking wide collar and cuffs are some of the highlights of Florence. Milano is a classic and romantic strapless ball gown in luxurious silk. The floral artwork on Milano gleams as the dress moves. Soft lines and a gorgeous beaded illusion back defines Portofino. Portofino with one of captivating details that define this collection -- the bow belt. Porto Venere is such a stunning look! This silk wedding dress with plunging back features an oversized bow that doubles as a train. A close-up of Porto Venere. Super-chic Positano features a clean, unembellished sweetheart base paired with a statement-making overskirt. Close-up of Positano, showing the unique design of the detachable tulle skirt. Rome features a showstopping back. The magnificent sculptural bow is the highlight of Rome. Lace perfection! 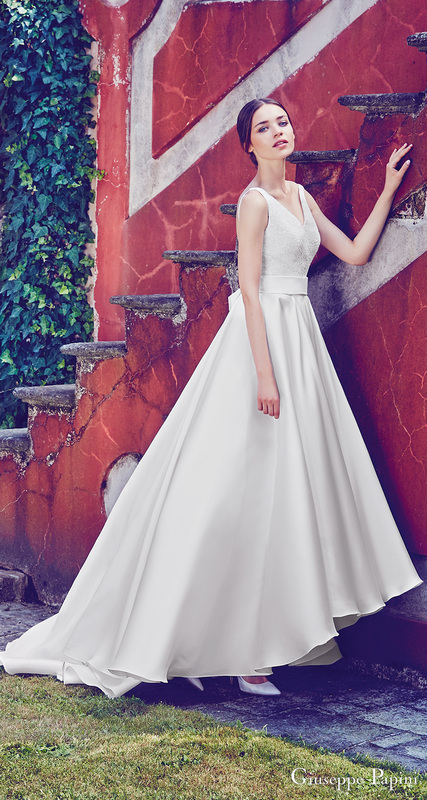 Taormina is every bit the fairy tale ball gown romantic brides dream of. Venice steals hearts with its beautiful tulle skirt. Venice's scintillating beaded V-neck bodice just makes it extra irresistible! Viareggio features a removable gossamery top made of sequins and beads. Verona's enchanting design features a wide ribbon belt. Como is a sleek mermaid gown with a exquisite crocheted lace jacket. So, have you fallen in love with a Giuseppe Papini wedding dress? 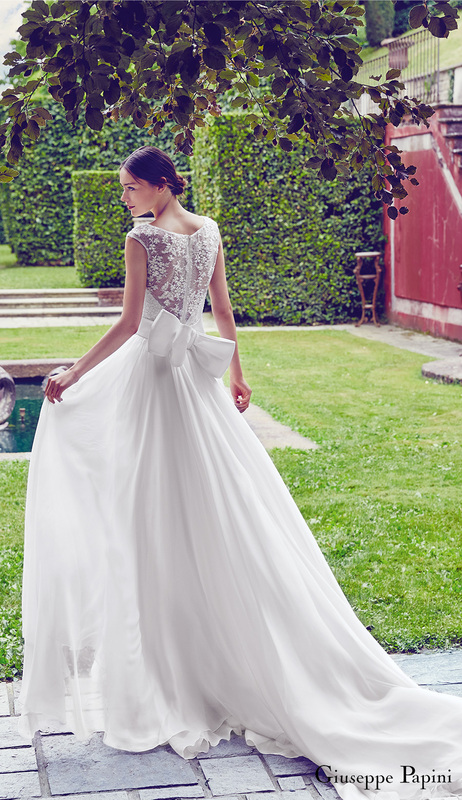 Giuseppe Papini's showroom is located in Bergamo, Italy, and the gowns can be found in select stores around the world. The Giuseppe Papini bridal collection will also be presented at the London NYC hotel during New York Bridal Week in April 2017. For details and appointments, please visit the contact page. 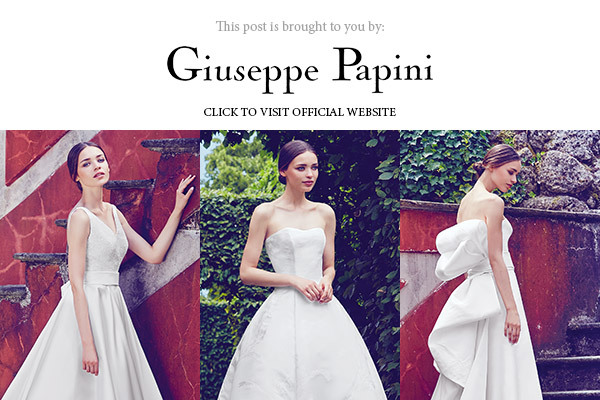 For more stunning inspiration and the latest news, you can also follow Giuseppe Papini's official pages on Pinterest, Instagram, Facebook, Tumblr, Twitter and Youtube.